Visual Analytics: Can Modern Organisations Compete Without It? Modern businesses and public-sector organisations create and consume increasingly large amounts of complex and interconnected data, yet common reporting strategies have not changed considerably for ten or fifteen years. Many larger and particularly competitive businesses have adopted more sophisticated methods of monitoring their KPIs with visual analytics. Is this merely a vanity project for those with bulging budgets, or is it becoming a necessity for agile and competitive businesses? Can businesses adequately monitor their performance with a variety of spreadsheets and ad-hoc reports, or are they making unverifiable decisions with anecdotal or unreliable data? Data can be presented in its most basic form in tables. 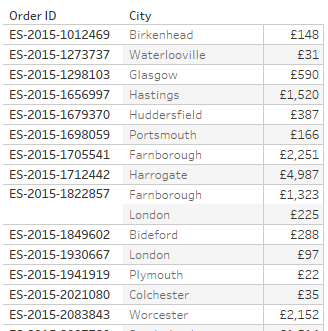 Whilst basic list data may be interpreted easily in this form, anything more complex is much more difficult. It is not a new finding that visual representations of data are much more powerful and faster to interpret by the human eye. Where data which should logically be connected and is causally related, fragmentation into a variety of spreadsheets makes such an analysis almost impossible. Visual Analytics brings together one or more visualisations into a single ‘dashboard’. Functionality within the dashboard allows users to filter and drill into the data to enable faster and less fragmented identification of trends, weaknesses and opportunities. Business decisions may be made based on such actionable insights. By their functionality, workflow, and ease of use, data analytics platforms short-circuit these frustrations. Time, cost and technical challenges which previously prevented access to powerful insights may be overcome. By selecting the most appropriate chart for the data analysis, the interpretation and actionability of that data will be radically enhanced. Which Platforms Deliver Powerful Visual Analytics? 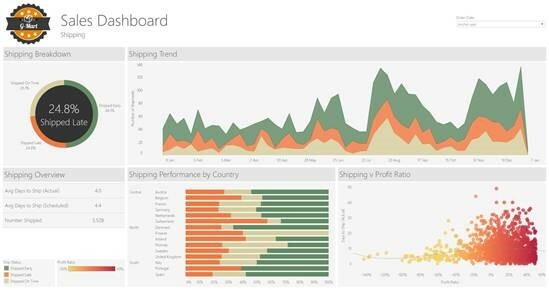 Tableau and Power BI are examples of fully-featured analytics tools. Both have a Windows-based desktop editing tool, and dashboards may be then viewed and leveraged in a web browser. They both feature drag and drop interfaces which make self-service analytics a real proposition. The presentational features allow the creation of intuitive and clear dashboards. 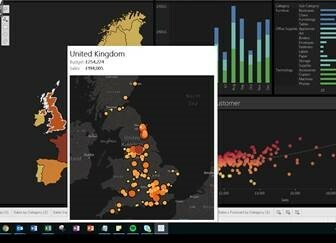 For the remaining examples in this article, Tableau will be discussed, though many of the same features are available in Power BI. Development begins by creating datasets which may connect to multiple databases, files, spreadsheets and cloud applications. Then, any business logic is created such as calculated fields. Once the data and logic are in good shape, the dashboards can be built, and filters assigned. Once created, the dashboards can be published to the web. Blend data from the cloud and multiple data sources from your systems, which may be refreshed on a schedule. Interactive web dashboards can then be viewed in a browser or mobile device as well as the desktop application. Once published to Tableau Server, your dashboards may be accessed and used by anyone with a modern web browser. Filtering, subscription and email alert functions are available, and data may be downloaded into csv files if required. To provide a near real-time experience, Tableau has a data refresh model which can be set at an interval of your choosing. The great advantage of this ‘extract’ model is the speed at which the dashboards operate. Are Costs Prohibitive for Smaller Businesses? 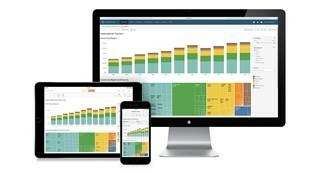 With a new licencing model, and a low entry point for a minimal setup, the total cost of ownership does not put Tableau beyond the reach of smaller businesses. 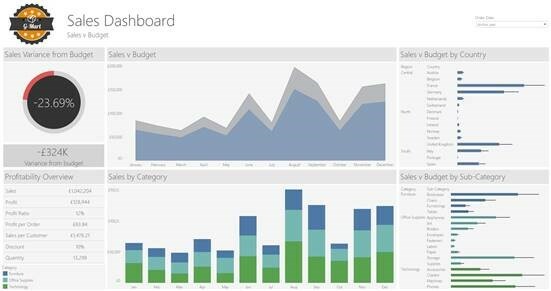 Power BI is also very cost effective, and both permit the scaling-up of your analytics projects with relative ease. The project management, build and training required for your analytics project are a major factor which are essential to a successful deployment. Brighter Connections offer consultancy services in relation to this, and we would be happy to discuss your requirements, and provide some advice. Increasingly, businesses are using more sophisticated reporting mechanisms as standard. The role of visual analytics is central to measuring key performance indicators such that decision makers can constantly monitor them and be accurately informed when action should be taken. Implementation costs are in line with the scale of a business, and the risks associated with not tracking performance or having knowledge of threats and opportunities outweighs them. Visual analytics is not new, but technological advances make it more powerful than ever, and increasingly an indispensable toolkit for the management of any business.